Italian photographer, Filippo Blengini produced the largest panoramic photo ever made, with a Canon EOS-70D camera, EF 400mm f/2.8L IS II lens, and a 2X Extender III. The previous world record holder was a 320GB panoramic photo of London, taken with the Canon EOS-7D and EF 400mm f/2.8L IS II lens. The new photo took 2 weeks to capture. The team worked in altitudes of around 3.500 meters (about 11.500 ft) and temperatures of below -10 degree Celcius (14 degree Fahrenheit). 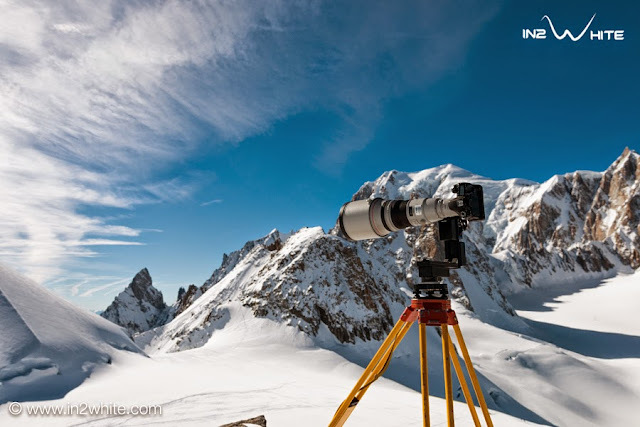 They took 70,000 photos of Europe's highest mountain, Mont Blanc. The 365 gigapixel, high resolution photo can be viewed here.